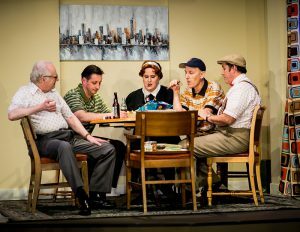 This “Odd Couple” sets the stage for an enjoyable evening. We all know the story line of two men who are separated from their wives and trying to live together as roommates, with great humor. Since its Broadway premiere in 1965, this play has survived many successful movies and sitcoms. Felix and Oscar are so well known that they could be distant cousins at our holiday parties. Here we are, laughing at their one-liner jokes again. Directors Mike Reynolds and Jay Krohnengold have put together a memorable cast who try to fill the historic roles. Doing old iconic comedy is not easy: if one tries to replicate the old roles, the characters inevitably fall flat. Reynolds and Krohnengold attempt to define somewhat new characters that tell the story faithfully, with slapstick physicality. This story and one-liners are enjoyable and make for a fun evening, but the show just does not stand out against the backdrop of 53 years exposure. 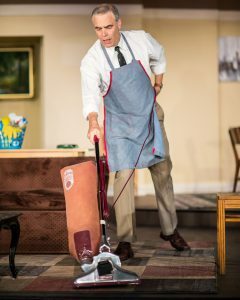 Russ Whismore (playing Oscar) does a good slob and bachelor impression, but cannot live up to the unkempt, disorderly, disgraceful and impolite Oscar we all know and love. Whismore entertains us with his timing and underhanded comments, however, and keeps the show alive with the role. David Boyll (playing Felix) makes a good discarded husband and unwilling roommate, with the lighter side of innocence taking over his role. One cannot imagine why his wife threw him out, except for his compulsive cleanliness and gourmet food fetish. These qualities make him the perfect mate for our time, actually. In Felix’s case, his guilt complex makes him very human. One character of note is Jill Wagoner, playing Speed. She has fun poking her (fake) cigarette and sarcastic comments at the other players during the poker (pun intended) games during the show. This makes the endless poker game rather interesting. Another notable character is Jayme Catalano, playing Gwendolyn Pigeon. Catalano plays with Felix as he tells his sad tale of marital woe. Her nervous giggles turn to sobs of empathy through the tale, finally changing to a cold anger at Oscar when he throws Felix out. Not bad. Ron Krempetz designed a very useable stage for the production, although the poker table was a bit far upstage for that mainstay comedy and action. Frank Sarubbi managed the lights for this large set very well, even providing color through the highrise windows. Richard Squeri also deserves some recognition for his fight choreography in the production. His work made the slapstick antics safe and effective. Overall, a great show to kick back and laugh with. Felix and Oscar may not come to some agreement and make-up at the end of the show, but they (and the audience) have fun with the resulting confusion while they press their positions. 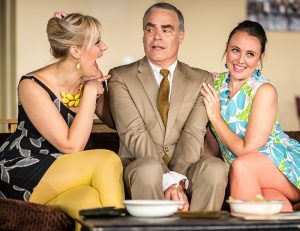 “The Odd Couple,” by Neil Simon is produced by Ross Valley Players. Directors: Mike Reynolds and Jay Krohnengold. Scenic Designer: Ron Krempetz. Costume Designer: Michael A. Berg. Sound Designer: Bruce Vieira. Lighting Designer: Frank Sarubbi. Fight Choreographer: Richard Squeri. Cast: Russ Whismore: Oscar. David Boyll: Felix. Patrick Barr: Vinnie. Jayme Catalano: Gwendolyn Pigeon. Philip Goleman: Murray. Frederick Lein: Roy. Jill Wagoner: Speed. Crystal Wilson: Cecily Pigeon.